This page is being continuously updated. Please contact me and suggest an artist. Suggestions for new additions are always welcome. Note: the banner is a section of Julie Nettleton's RHS Gold Medal winning exhibit of Xanthorroea (Grass Trees) in 2016. See below for more about the artist. Beverly Allen GM (RHS 2007, NYBG 2010) - b. 1945 in Sydney, Australia. BA in Fine Arts from Sydney University. A graphic designer who became a botanical artist in 1998. Began studying botanical art in 1997. She has shown annually at the Royal Botanic Garden, Sydney ‘Botanica’ Exhibition since 1999, and exhibits internationally. In 2004 she exhibited at the 11th International exhibition at the Hunt. She won an RHS Gold in 2007 for eight watercolour paintings of Epiphyllum. In 2010, she was awarded the inaugural Gold Medal for Botanical Art by the New York Botanic Gardens. Her work is in many major collections including Kew, the RHS Lindley Library, the Hunt, Highgrove and Transylvania Florilegiums. and the Shirley Sherwood and Alisa and Isaac Sutton Collections. It can also be seen in a large number of publications. She is the Co-Founder and President of the Florilegium Society associated with the Royal Botanic Gardens and Domain Trust in Sydney where she also teaches masterclasses. Work available from Jonathan Cooper's Park Walk Gallery. Deirdre Bean GM (2006) - b. 1960 in Newcasle, New South Wales. She won a Gold Medal in 2006 for her for her series of eight Syzygium species. 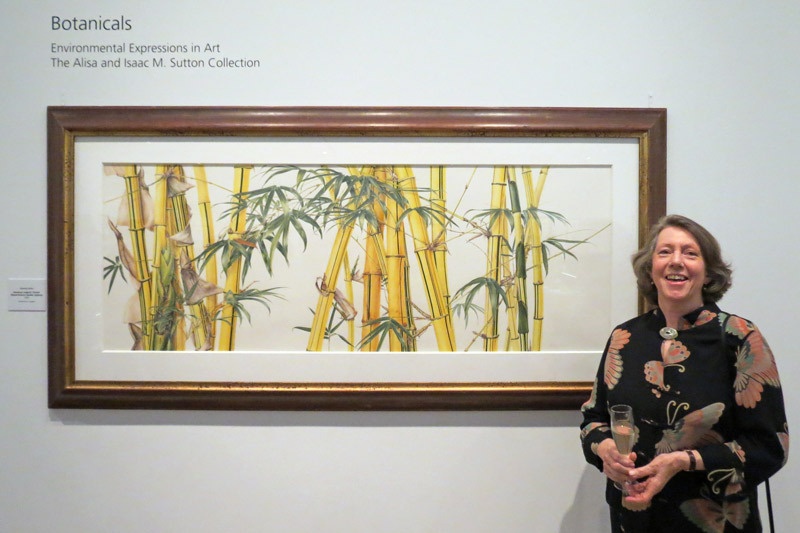 Deirdre has paintings in public collections at the Royal Botanic Gardens, Kew, London, the Hunt Institute of Botanical Documentation, Pittsburgh, USA, and in the Florilegium collection at the Royal Botanic Gardens Sydney. Mangroves are the subject of Deirdre's post graduate studies in Natural History Illustration. I believe she is one of today's best botanical artists and an example of Australia's depth of quality in this field. ​Popular producer of botanical art instruction videos; illustrated five books on flora and fauna of the Australian Capital Territory and Alpine flora; member of the Florilegium Society at the Sheffield Botanical Gardens UK. Became interested in botanical art in 2010. She is a Artist, Painter, Illustrator and Designer specialising in botanical subjects. Exhibited at Hunt 15th International. 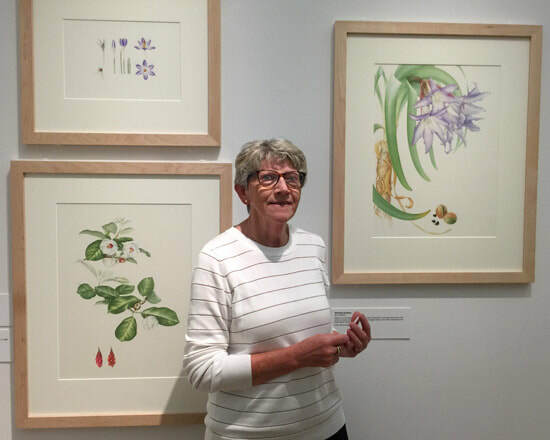 Fiona McKinnon - Has exhibited botanical works since 1994 and is selected regularly for many group exhibitions, including The Art of Botanical Illustration [RBG Melb.] 1994-2016; Botanica [RBG Sydney] 2005-2016; BotanicAsia [RBG Melb.] 2009. She also exhibited at the 10th International Exhibition at the Hunt Institute. Her work is in the Highgrove Florilegium, the Florilegium of the Royal Botanic Gardens, Sydney, the State Botanical Collection. She was awarded a Celia Rosser Medal at The Art of Botanical Illustration in 2014 for her Eucalyptus paintings. Fiona has taught at Jenny Phillips’ Botanical Art School of Melbourne since 1996. Mali Moir GM - In 1993 she became the botanical artist in 1993 at the National Herbarium of Victoria, contributing pen and ink drawings for many scientific publications. Exhibited in the 10th International Exhibition at the Hunt. She exhibits widely in Australia and internationally and has produced many works for private, public and corporate collections. Elaine Musgrave GM (2003) -​​​ Lives in the Southern Highlands of NSW. Started botanical painting in 1995 and works in watercolour or graphite. Has exhibited annually in the Botanica art exhibition at RBGS since 1999. She has an RHS Gold Medal (2003). Her work is in the collections of the Hunt Institute, Alisa and Isaac M Sutton and the Hawkesbury Regional Gallery. She is a founding committee members of the Member of the RBGS Florilegium Society - and has four works in the exhibition. Margaret Muffet - has work in the Hunt and government collections in Australia plus three Silver Gilt Medals for two series of Protea and one of Eucalyptus paintings. Rita Parkinson GM - studied fine art at St Martin's College of Art and art history at The Courtauld Institute of Art in London. Worked as a freelance illustrator in educational publishing (natural history and science) and is the author of two botanical art instruction books. Lives in Melbourne and now concentrates on botanical illustration. Awarded RHS Gold Medal for a series of paintings in the Agave family. Tutor at the Geelong Botanical Gardens.Victoria. Australia. 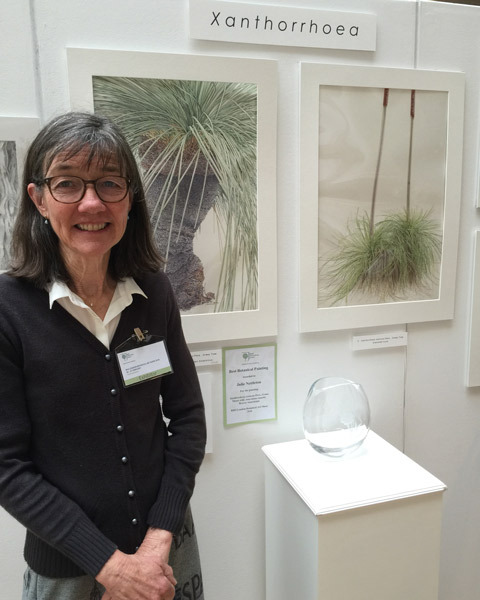 Julie Nettleton with her Gold Medal winning exhibit of Xanthorroea (Grass Trees) at the 2016 RHS London Botanical Art Show. She won Best Painting in Show for "Xanthorrhoea and marsupial mouse"
​​John Pastoriza-Piñol GM (2005) - based in Melbourne. RHS GM for 'Paphiopediulm and Dracula orchids in watercolour'. His has work in the collections RBG Kew Library, The Highgrove Florilegium, The Transylvania Florilegium, Hunt Institute, Royal Botanic Gardens Sydney, Geelong Botanic Gardens Victoria, Art Gallery of Ballarat, RMIT University Melbourne and Collection of Alisa and Isaac M. Sutton. Exhibits frequently and internationally including at the 12th International at the Hunt. Awarded the ASBA Diane Bouchier Award for Excellence as well as other prizes. Teaches botanical Art at the Geelong Botanic Gardens (14+ years). Member of BAS, ASBA and RBGS Florilegium Society. Jenny Phillips GM (1993) - Founder/Director of The Botanical Art School of Melbourne, Australia. She's also a Fellow of the Linnean Society and has won the Celia Rosser Award. Exhibited at the 10th International at the Hunt. She has work in the Hunt, the Shirley Sherwood Collection, the Highgrove Florilegium and the Filoli Florilegium, Royal Botanic Gardens, Melbourne . She is also an Honorary member of both the Chelsea Physic Garden and Brooklyn Florilegium Societies. ​​Celia Rosser OAM PhD (Hon.) - b. 1930. One of the world's finest living botanical artists. Published The Banksias,, a three-volume series of monographs (1981, 1988 and 2000) containing watercolour paintings of every Banksia species - over 25 years. She worked as the University Artist for Monash University. Awarded the Linnaean Society of London's Jill Smythies Award for botanical illustration (1977); awarded a Medal of the Order of Australia (1995). Monash University awarded her an honorary Master of Science degree in 1981, and an honorary PhD in 1999. The last discovered species of Banksia was named after her. Has exhibited at the Hunt. 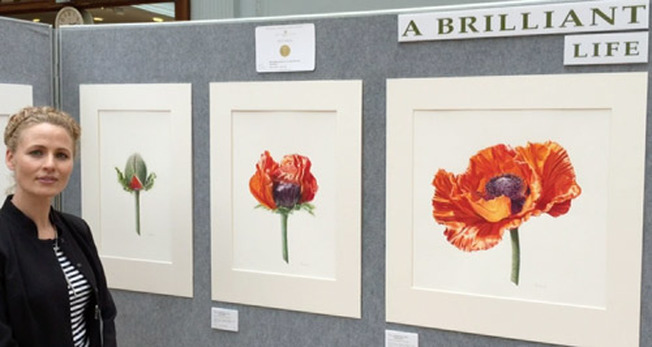 The "Celia Rosser Medal for Botanical Art" is now awarded to outstanding exhibitors at their "The Art of Botanical Illustration" exhibition by he Friends of the Royal Botanic Gardens Melbourne. Trained with Jenny Phillips and has practiced as a botanical artist since 1996. 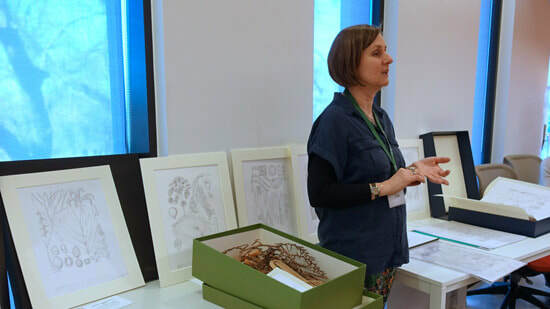 Her work has been added to the collections of the National Herbarium collection in Melbourne, the Florilegium Society for the Sydney Herbarium, the Sutton collection in New York and private collections throughout Australia. A botanical painter for over 30 years - painting mainly Australian natives. She was the first Australian botanical artist to win an RHS Gold Medal - for her display of 22 species of Australian mistletoes. Commissioned to create paintings for the Hunt and the Shirley Sherwood Collections. Her work has won a number of prizes. born Brisbane 1951 and lives in near Sienna in Italy. 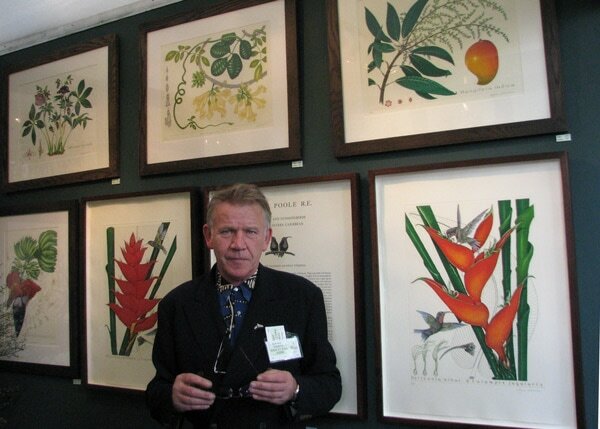 Botanical artist since 1976 and teacher of botanical art in Australia and the USA. Her paintings have been widely exhibited by Shirley Sherwood and she is a featured artist in A Passion for Plants. Founding member of the Botanic Artists Group Queensland and the Australian Botanical Art Society. Colleen is a botanical and wildlife artist who is particularly interested in rainforest species. Born and educated in Sydney, she now lives west of Wauchope, NSW, where she she has developed a farm and a nursery, growing and propagating local native plants especially rainforest species. The book is both a celebration of 10 colonial women artists who became botanical artists in the 19th and 20th centuries - and their artwork. ​A biographical profile is provided and their individual roles in relation to Australian botanical history is examined. Images come from the The National Library of Australia which has a collection of Australian wildflower art produced by prolific women artists of colonial and post colonial Australia. ​The book represents the work of the major artists and illustrators of Australian plants. New Zealand seems to have a strong tradition in producing top class botanical artists. ​consequently it's easier to see art by New Zealand artists in the UK, Europe, USA and Australia! ​​Nancy Adams CBE QSO (1926-2007) a New Zealand botanist and museum curator. She was the first botanical artist for the Botany Division of the Department of Scientific Research in 1943. She illustrated c. 40 publications on native plants, alpine life, trees and shrubs. She was awarded the Queen’s Service Order in 1989 and a 1990 Commemorative Medal for services to New Zealand botany. (Obituary). Denise Ramsay GM (2014) - Denise won an RHS gold medal at her first attempt with "A Brilliant Life - Papaver Orientale". The complete set of six paintings were then purchased by Dr. Shirley Sherwood for her collection. You can see a VIDEO interview with Denise with her artwork in the RHS Lindley Hall on the RHS Botanical Art Exhibitions Page. Denise also achieved a Distinction in her Diploma from the Society of Botanical Artists. Terrie Reddish (GM 2008) - Terrie was awarded a gold medal at the Royal Horticultural Society's December 2008 show. Exhibited at the 15th Hunt International. Work in the Lindley Library and Shirley Sherwood Collection. Lives in Hawke's Bay on North Island. ​Sue Wickison GM (2008) - Sue was born in Sierra Leone and did her degree in Scientific Illustration in London. She now lives in New Zealand. 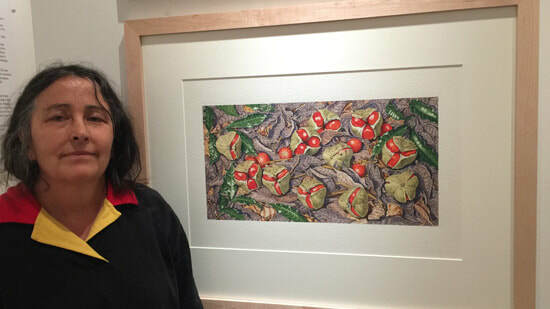 She has exhibited at the Shirley Sherwood Gallery, the Hunt Institute and the Margaret Flockton Award and with the SBA in London and Frankfurt Palmengarten. Susan Worthington - Three paintings included in the Highgrove Florilegium and one in the Shirley Sherwood Collection. Six of her paintings of New Zealand garden flowers were selected by the New Zealand Postal Service for an issue of stamps and the First Day Cover. This is the more affordable revised edition - including 163 full-colour, full-page reproductions of Audrey Eagle’s botanical paintings - from her the award-winning Eagle’s Complete Trees and Shrubs of New Zealand"
Terrie Reddish GM (2008) - a contemporary book and botanical artist based in the Hawke's Bay. Awarded a gold medal at the Royal Horticultural Society's December 2008 show for her paintings of New Zealand Flax. Work in the Lindley Library and Shirley Sherwood Collection. She primarily uses coloured pencils for her work.